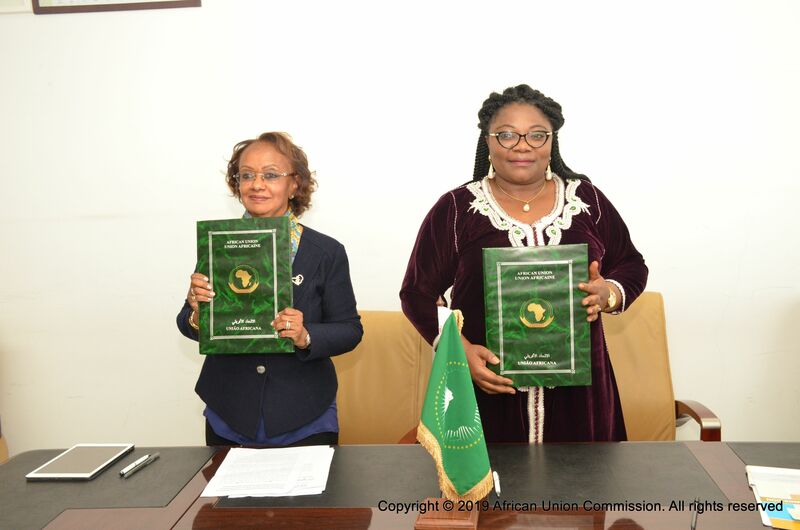 Addis Ababa, Ethiopia, 25 January 2019: The African Union Commission (AUC) signed a Memorandum of Understanding (MOU) with Africa Early Childhood Network (AfECN) which sets out the framework for cooperation in order to ensure closer collaboration and exchange of information between AUC and AfECN, in a manner that creates synergistic relationships and partnerships situating Early Childhood Education and Development within the Continental Education Strategy for Africa (CESA 16-25). The signing ceremony held at the AU Headquarters in Addis Ababa, Ethiopia was done by H.E. Professor Sarah Anyang Agbor, Commissioner for Human Resources, Science and Technology and Ms. Aster Haregot, Board Member of AfECN, and both pledged to deepen bilateral cooperation in Early Childhood Education and Development (ECED) in Africa. The MOU sets out the framework for cooperation in order to ensure closer collaboration and exchange of information between AUC and AfECN, in a manner that creates synergistic relationships and partnerships situating Early Childhood Education and Development within the Continental Education Strategy for Africa (CESA 16-25). DSC_0038The Commissioner for Human Resources, Science and Technology of the African Union Commission welcomed this partnership and said that Early Childhood Education and Development is at the foundation of the achievement of Agenda 2063 – The Africa We Want. “The African Union Commission considers early years as presenting a time of great opportunity, and are decisive for human development. Hence this calls for strengthened action to enhance investment and engage stakeholders in Early Childhood Education and Development (ECED)” she noted. The Director of Human Resources, Science and Technology Department of the African Union Commission, Dr. Mahama Ouedraogo stated that the MoU came about due to the priority that is placed on Early Childhood Education and Development within the AU Education Programme and the commitment of AfECN to this cause. In the same vein, Ms. Aster Haregot expressed satisfaction to the partnership between the AU and her organisation. She reiterated the willingness of AfECN to support the realization of CESA 16-25 and Agenda 2063 by reaching out to various stakeholders on the continent: AU Member States, Regional Economic Communities, Development Partners, Civil Society and Private sector to garner the muti-stakeholder support which is required for delivering quality care and education to children in their early years.